We offer outstanding early years education for children aged 3 to 4 years in our Nursery School, and for children aged 2 to 3 years in Fullbrook Little Explorers. As a Local Authority Nursery School we are inspected by Ofsted every three years. Both settings share one Ofsted registration and were last inspected in October 2016, the full report can be accessed by clicking on the link below. An Ofsted judgement of Outstanding was given. 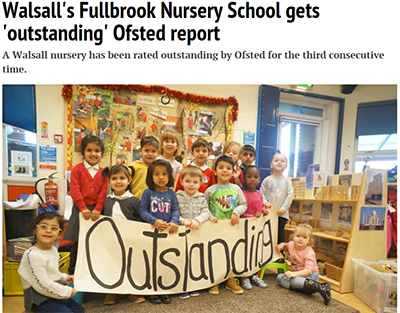 Fullbrook Nursery School has now received three consecutive ‘Outstanding’ Ofsted judgements.